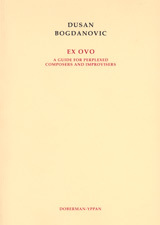 Simultaneously a textbook and a collection of essays, Ex Ovo by Dusan Bogdanovic is a theoretical and practical guide for contemporary composers and improvisers. The book includes chapters on Baroque and Jazz improvisation, species counterpoint, music aesthetics as well as a comprehensive theory of motivic transformations. The book is illustrated with drawings by M. C. Escher and contains excerpts ranging from African tribal music to works by contemporary composers such as Ligeti, Reilly, Reich, Feldman, Nancarrow and others. DO 534 - 115 p.